The Atkins diet principles lay the foundation for a healthy, more balanced way of eating than the standard American diet. Its emphasis is on using good carbohydrates in balance with adequate protein. This is in stark contrast to what most Americans eat on a daily basis. The average American eats lots of processed foods that have hidden sugars and highly processed carbohydrates. This has put most Americans on the road to diabetes and pre-diabetic conditions. What is sad is that diabetes has a predictable set of stages and that they can be easily recognized. The road to diabetes has to do with something called the glycemic index. All carbohydrates are rated on this index with regards to the level of insulin reaction they produce. Foods that have a high glycemic index rating will cause your pancreas to release a lot of insulin to break down the amount of sugars and carbohydrates (which produce high amounts of glucose). The refined carbohydrates and sugars that make up the vast majority of the American diet rank very high on the glycemic index. We are able to more readily digest these foods as children, because our bodies function more efficiently in our youth. There may have been side effects, like weight gain and mood swings, but they didn’t stand out. As we age, however, these symptoms begin to grow and become more prevalent. The nation-wide obesity epidemic is a result of high-carbohydrate diets and unstable blood sugar levels. Many people who are overweight are also insulin resistant. Insulin resistance means that the insulin is not doing its job in removing glucose from the blood stream. The pancreas gets over worked and it releases massive amounts of insulin, sometimes 20 times more than the body actually needs. This results in the blood sugar dropping to extremely low levels. This sets off a chain reaction in the body that leads to a release of adrenaline to correct the blood sugar problem. With age, blood sugar and insulin difficulties become more aggravated. The condition is called “hyperinsulinism” and is a precursor for type II diabetes. It is normally accompanied by high blood pressure and high triglycerides. After years of using a high-carbohydrate diet, you will finally become fully diabetic. Insulin is the body’s primary fat creator and extra pounds usually accompany late onset diabetes. Pre-diabetic conditions, if not treated effectively, will lead to diabetes indefinitely. However, there are easily identifiable warning signs to diabetes that appear early. Your family doctor can perform insulin level tests that will let you know if you are at risk for pre-diabetic conditions, and studies show that low-carb diets like Atkins can help. 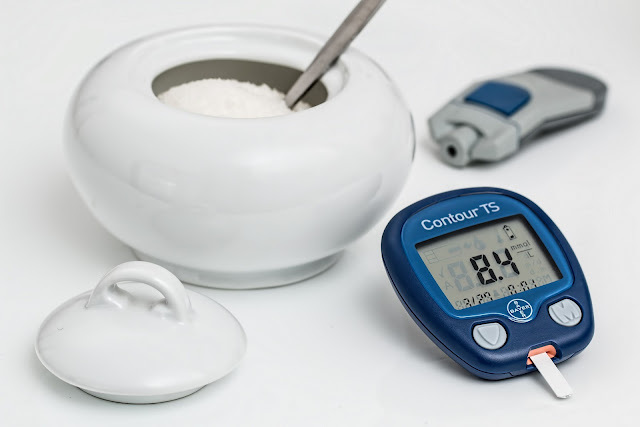 Controlling your blood sugar is one of the most effective methods to controlling pre-diabetic conditions. The Atkins diet helps effectively control blood sugar. The combination of proteins, fats and good carbohydrates will keep your body satisfied without the roller coaster effect. Controlling carbohydrates in quantity as well as type will help limit the insulin spikes. This will let your pancreas work in the way that it was meant to be, and it will decrease the likelihood of your developing pre-diabetic conditions. It’s a vicious cycle that, if left unchecked, can lead to diabetes later in life. When the Atkins diet is followed effectively it produces stable blood sugar throughout the day and helps you stay off the road to diabetes.